President Trump signed proclamations Thursday that institute a 25-percent tariff on steel and a 10-percent tariff on aluminum with exemptions for Canada and Mexico until the North American Free Trade Agreement is renegotiated. "I'm delivering on a promise I made during the campaign," he said, addressing the steel and aluminum workers who had come to the White House to see Mr. Trump sign the tariffs. The tariffs will go into effect 15 days from the proclamation signing, according to a White House official who briefed reporters on background. The president said he is open to modifying tariffs for some countries -- the Trump administration will allow any country that has a security relationship with the Trump administration to discuss potential modifications to "address the threatened impairment of the national security caused by imports from that country," the official added. Some countries might qualify for an exemption if their products "no longer threaten our security," the president said. Mr. Trump's announcement comes after a hullabaloo of a week: Gary Cohn, the president's chief economic adviser, said that he planned to resign from the administration on Tuesday, after vehemently lobbying against steel and aluminum tariffs. The former Goldman Sachs executive lost out to White House aide and resident nationalist Peter Navarro and Commerce Secretary Wilbur Ross who have petitioned for an aggressive protectionist trade policy. Nevertheless, flanked by steel and aluminum workers "from the heartland," Mr. Trump signed the two proclamations. 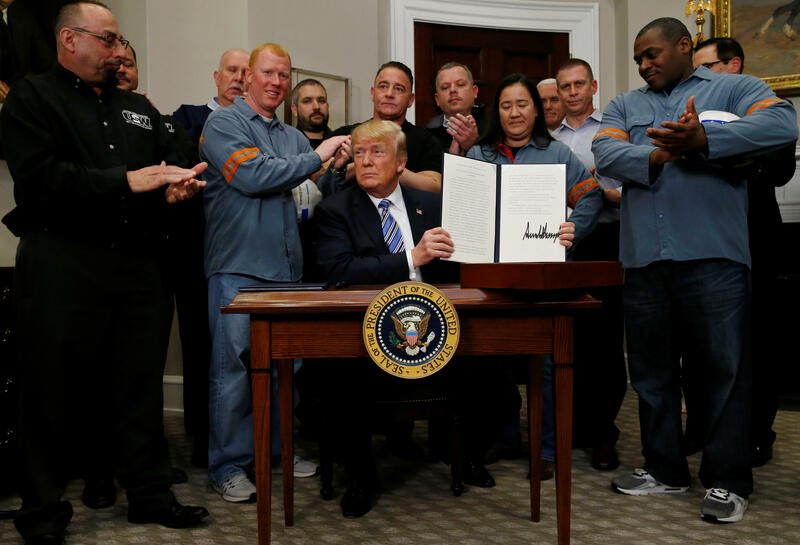 The White House official touts the 500 jobs that will be restored to steel workers in Illinois, after U.S. Steel announced that it would be restarting their factory because of the decision to impose tariffs. "It should be a great day for America," the White House official said. Cohn wasn't the only one angered and blindsided by the president's decision to impose tariffs on steel and aluminum imports, despite the fact that it's an issue Mr. Trump has consistently complained about for decades. A group of 107 Republicans on the Hill released a letter on Wednesday urging the president to "reconsider the idea of broad tariffs to avoided unintended negative consequences onto the U.S. economy and its workers." A White House official argued that dissent from Congress and others had not led to a "softening of our position in any way whatsoever," but that the proclamation was designed to be flexible with partners "we have great relationships with," naming Canada, Mexico, Europe and Australia. "We are not looking to get into trade wars. We are looking to make sure that U.S. companies can compete fairly around the world," Treasury Secretary Steve Mnuchin said Tuesday at the House Appropriates hearing. The president himself has struck a less measured tone on Twitter and in person. "When we're behind on every single country, trade wars aren't so bad," Mr. Trump said at a press conference with the Swedish prime minister on Tuesday.